The created world around us in this season of Lent is poised to explode in colour – on this wet Spring day the blossoms on trees are just beginning to open – there is the expectation of Easter joy and glory ready to burst forth after months of winter! Yet it has been a sad week in the news, with the plane crash in the Alps, and with the chilling details being revealed that it was a deliberate act by someone put in a position of such great responsibility for the lives of others. Described in the media as “hard to comprehend”, certainly. But, as some said, “unthinkable”, no, as Christians we are realists, we know that humanity is in need of a Saviour. We know that in the past century, human beings in government, not suffering a mental illness, but by cold calculating reason, made choices that led to the deaths of millions. There are many destructive ideologies today that result in the deaths of thousands every month. We know the hearts of human beings are capable of great evil…but also of incredible goodness – how can we change the human heart that it seeks only what is good? We can’t. Then how can God accomplish that without another flood? This is precisely why we are here today looking to Jesus Christ. Today is the start of Holy Week. We will bring before our minds this week Christ’s suffering and death. It will be before our minds in all sorts of ways even in the secular world we live in (on my drive to Zwolle today Radio 4 was playing Bach’s St John’s Passion! Everywhere they are going the through the motions selling eggs – why eggs! We know what must come first!). We are called to think on Christ’s passion again – not to glorify its violence, but because it is a knowledge, if really taken inwardly, that breaks apart stony hearts. We come to know more clearly the cost of sin, and with greater certainty the love of Christ, and that it might be shed abroad in our hearts. 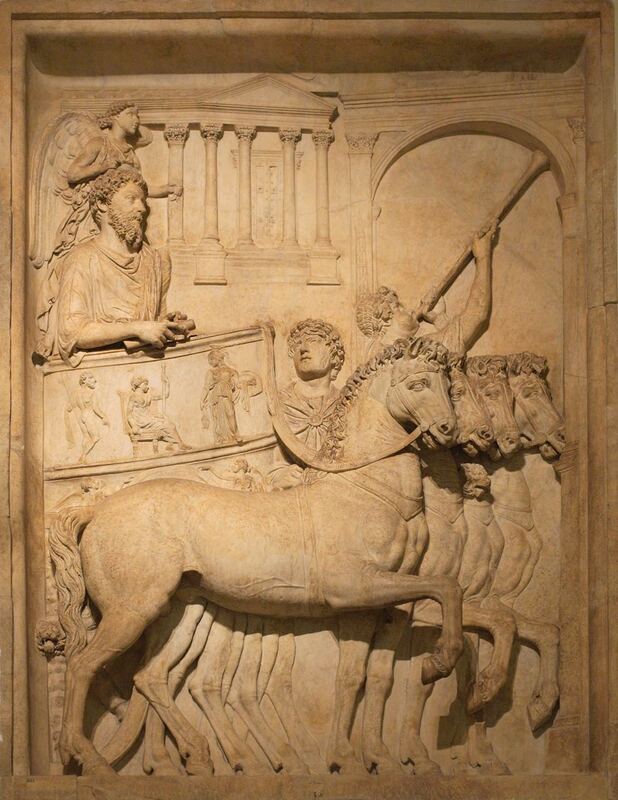 Triumph Chariot, bas relief from Arch of Marcus Aurelius in Rome, 2nd century. In the first gospel reading today we have heard about Jesus’ entry into Jerusalem. He was riding on a donkey. At the time of Jesus’ earthly life, after a great military victory, a ruler would come home to celebrate the victory with a huge parade, and a triumphal entry back into the main city of the country. It was the custom that the general or King entered the city riding a large stallion, the best horse, a symbol of power and of majesty and authority. Or in the case of Roman Emperors, they were often depicted in a chariot drawn by four of the best horses. And palms were waved as a sign of Victory in war. 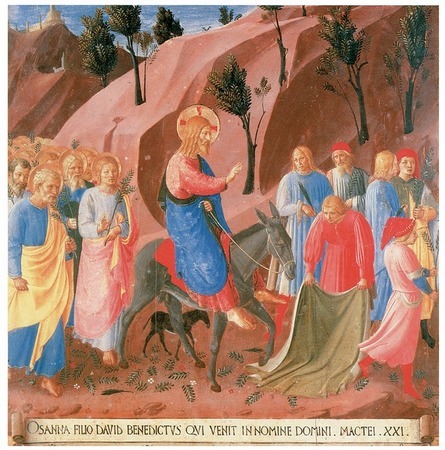 Jesus, the true King, the one through whom the whole creation was made, chose to make his entry into Jerusalem, the City of Peace, on a donkey – a symbol of humility, the choice of a poor person for transportation in that day. Imagine the reaction of the Roman soldiers to this sort of entry – not much of a threat, more of a joke, who are these Jewish people and their strange customs? Yet, whose power has endured, Caesar or Jesus? God chooses ways to get around the obstacles that we set up to reject him. Our pride is the foremost obstacle to submitting ourselves to the rule of heaven, so God comes to us humbly, to slip by us and so strike at our hearts! 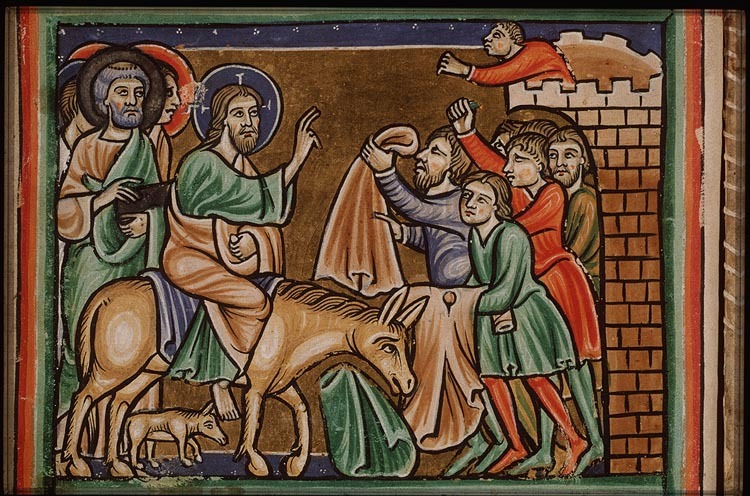 Jesus chooses the donkey also, very deliberately, knowing himself to be the fulfillment of the Law and the Prophets. humble and riding on a donkey and on a colt the foal of a donkey. Here, remarkably, the wording parallels in a way the much earlier blessing of Jacob, but the reference to the vine is now more explicitly connected with Israel’s coming king. Jesus, the One whom David called his Lord (Ps 110) and who, as David’s descendant and the Messiah is called Son of David (Mt 1:1-17; Luke 3:23-38), follows the same way of entry into the holy city as David did 1000 years before. Next, we have heard from St Matthew’s Gospel account of the Passion of how that victory is achieved: not easily, not immediately, but the true conversion of hearts to God, one person at a time even to present day. It comes about through the accepting of Jesus’ death upon the Cross for us. This coming Holy Week in our services at Holy Trinity (or if you cannot come you could read them at home) we will read through the passion story as told by Mark (on Monday and Tuesday night), Luke (on Wednesday and Thursday nights) and then John on Good Friday. And there are so many things revealed about human nature that are so vivid before our minds: the surprise anointing of Jesus body beforehand with precious ointment by a woman in a loving and prophetic gesture; the Last Supper together between Jesus with his disciples – he says, With desire have I desired to eat this Passover with you; the fleeting moments in the garden told to us of human weakness and Christ’s steadfastness; and then his arrest, trial, conviction, and crucifixion. We hear of the excitement and terror of the disciples, of betrayal and cowardice, of justice perverted, of truth denied, of the cruelty of man to man, of abandondment, and in the midst of it moments of the flashing forth of great courage and of course, of our Lord’s patience through all of it and, most profoundly, of His love. What other movement political or religious focusses so much on small and great interactions over a period of three days? These moments recorded in Scripture are all so excruciatingly human, they are so woven into our daily encounters with others, they are repeated again and again in human society. And if we are listening deeply, we catch ourselves from joining in with the mockers, we step in the breech when we see another being bullied, we hold back our anger from spilling out on the innocent around us, we weep over the oppressed, we take the right action…and are hurt, like him…and we know a kind of death, like him… and then also, like him, a resurrection. it is in the shape of the Cross – the way and means to that victory. St Paul says, Let this mind be in you, which was also in Christ Jesus. Jesus came to all humanity humble and riding on a donkey into Jerusalem. He didn’t force the people to accept Him as King, even though He is King of the Universe, even though he could call upon those legions of angels to force an earthly kingdom. But he didn’t use his power that way then and he doesn’t use it that way now. He comes to us humbly, to serve us; the tables are turned, He waits for us to allow Him to serve us. Jesus is riding humbly to our souls today. He is even now asking, knocking, waiting for us to open wider the door of our hearts to Him. He waits for us to accept Him as our King, He wants us to want Him, to love Him freely. Let’s open wider our hearts to Him this week and always. Almighty and everlasting God; who in your tender love towards mankind, sent your Son, our Saviour Jesus Christ, to take upon him our flesh, and to suffer death upon the cross, that all mankind should follow the example of his great humility: Mercifully grant, that we may both follow the example of his patience, and also be made partakers of his resurrection, through the same Jesus Christ our Lord. Amen. This entry was posted in Sermons on 30 March 2015 by Linda Fone.